Handcrafted and made in the USA lead-free pewter Happy Howlidays Ornament Picture Frame features a festive snow covered doghouse with a gold sparkly starand a "Happy Howlidays" sign with a red satin ribbon for easy hanging. 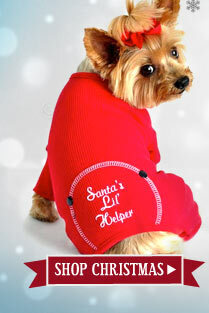 Soft alpaca wool dog sweater featuring a cute gingerbread man with candy cane striped scarf. A fun Elf Dog Costume for your dog. It features a one piece bodysuit and a matching elf hat. Festive Christmas collars in metallic red or green decorated with crystal bones. Cute bone shaped Christmas ornament measures 3.7" wide X 1.6" tall. 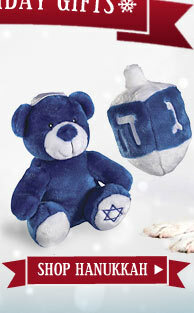 It's possible for you to personalize this ornament and write the dog's name on it before gifting. Picture frame Christmas ornament will be cherished for years to come. Holds a wallet-sized picture of your best friend. You can personalize this ornament by writing the dog's name on the bone. A lovely gift to give any dog lover. Royal Dog heart shaped Christmas ornament decorated with a bone, pawprints and a crown. You can personalize this ornament by writing the dog's name on the plain white bone. Raised wooden dog diner reminiscent of an antique stool will keep your dog's food and water bowls at a comfortable height of 6 or 12 inches. Natural American Maple table top with tapered legs in a delicious apple red finish or white. Handcrafted and made in the USA lead-free pewter Santa Paws Ornament Picture Frame is a thoughtful lasting holiday gift that will be cherished for years to come. The frame measures 2.25H x 2W inches. Handcrafted and made in the USA lead-free pewter Snowflake Ornament Picture Frame is a thoughtful lasting holiday gift that will be cherished for years to come. The frame measures 2.5 x 2.5 inches and holds a small 1.25" round picture. This year round plaid pull over jacket is perfect for wearing Indoors and Out. 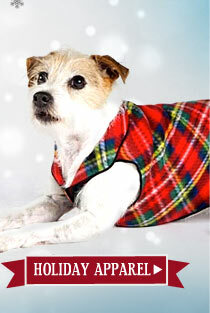 It's very easy to put on and moves with your dog, making it the most comfortable coat around. Dog Barrette Hair Bows Set of 4 Quatrefoil design. Your choice of colors. Choose all four the same, 2 different or all different. It's your choice!